Nations matter. National cultures matter. And national histories matter. As we try to understand what has happened in the United States, we should keep those three things in mind. There will be endless discussion of all the proximate causes of Donald Trump’s victory – such as the conduct of the Director of the FBI, mistakes by the Democrats, dislike of Hillary Clinton, economic problems in the rust belt – but little of it will confront a critical underlying issue: the national culture of the United States. Trump’s margin of victory is too big and too broad to be written off as simply a failure of the Clinton campaign, or a conspiracy engineered by rogue elements of the FBI to embarrass her in the final days of the election. There is something much larger and deeper going on, something rooted firmly in American history. For historians, Trump’s election comes as the trend toward transnational history continues to spread across North American universities. For anyone following trends on social media, especially twitter, Canadian history seems now to be so yesterday. The talk now focuses on decolonization, settler colonialism, and other post-national perspectives that reject seeing history through a national lens. These perspectives emphasize how national boundaries are arbitrary, how national institutions are oppressive, and how national cultures are barriers to social justice. For those on the radical end of this scholarly spectrum, Canadian studies belong in the dustbin of history. Like the trend in favour of economic globalization, the transnational movement in historical scholarship has something inexorable about it, as if anyone who questions it is questioning the very direction of history. Well, if we ever needed a reminder of the importance of national history, we got it last night. 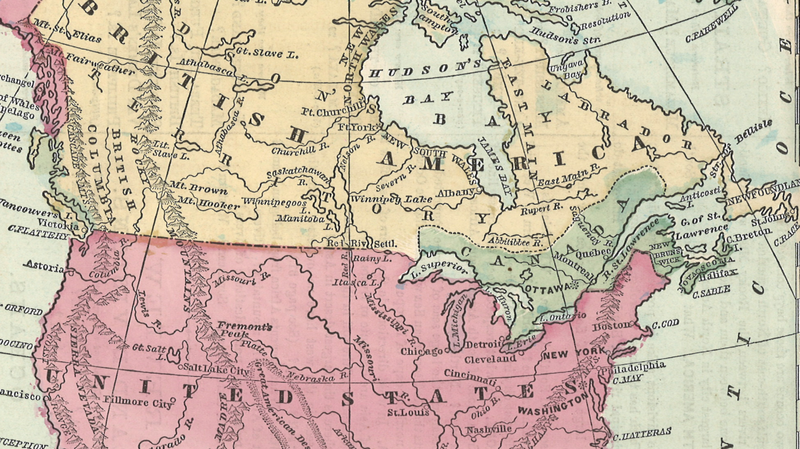 Despite all the ink spilled on connections across borders and links across the Atlantic world, American history diverges in critical ways from Canadian history. For all of our similarities as continental neighbours, our political cultures appear to be going in opposite directions. Those differences may seem minor to some, but this morning they feel more important than ever. One of the drawbacks of transnational history is that it emphasizes connections across geography over differences across nations. It can tell us a great deal about issues such as environmental change or migration patterns, but it tells us little about why we are where we are this morning. As bad as things are in Canada, it is impossible to imagine Donald Trump assuming power here. Does this matter? I think it does. It matters because, however bad things are here, there are some traditions in our national political culture that are worth recognizing and protecting. As we study the racism, exploitation, and oppression in Canadian history, we should also study how patterns in Canada compare to those in the United States. I am not – not for a second, despite the angry tweets that I’m going to get! – denying in any way the tragedies in our past and the problems in our present; however, as we contemplate what the world will be like with a President Trump, we should pause for a moment and reflect on what makes us different from the United States. Such a reflection might suggest that, in our effort to transcend the limitations of national history, we risk losing sight of what makes us distinctive. Depending on your perspective, that difference may be small, but it doesn’t feel that way today. No one I read or saw predicted Trump’s victory. No one knows what the next four years will hold. Perhaps, after a short-term crisis, things will seem normal again. We will attend conferences in trendy cities where transnational frameworks will be praised as innovative and national histories panned as anachronistic. The historians attending those conferences will all come from places that have deeply rooted national cultures, but they will act, at least for a few days, as if those cultures matter little to how we study and teach the past. Whereas most of these scholars oppose globalization as an economic phenomenon, they embrace it as an intellectual phenomenon. Early modern historians will have the benefit of walling themselves off from the present, because efforts to study the roots of national cultures risk breaking the cardinal rules of presentism and anachronism. Today, though, those rules don’t seem to matter much. Just as there is a pressing need to understand the present and future of a Trump presidency, there is a need to understand how we got here in the first place. There is a need, in other words, to explore the remote as well as the proximate causes. There is a need to recognize that, despite all the connections and similarities across empires and borders, the histories of Canada and the United States diverge fundamentally in important ways. We, as well as the rest of the world, will have to cope with whatever happens over the coming years. We never voted for Trump, but we will feel the effects of his government and his policies. As we search for answers and understanding, we need to reconsider the importance of national history, national institutions, and the road not travelled. For more, see Bannister’s previous essay on Settler Colonialism and the Future of Canadian History. Featured image: From Monteith’s Physical and Political Geography, by James Monteith (1872) [detail]. Public domain via Wikimedia Commons. Great piece and I agree with your remarks about the uses of national history. But I would take issue with one observation: “No one I read or saw predicted Trump’s victory.” I’ve talked to non-historians who didn’t see it coming and historians who did, and I would include myself amongst those. Clinton’s adversaries were just too much like the people we study. I’m teaching the rebellions this week: hey look, lower middle/working class economic rage, enhanced by anti-immigrant, anti-women rhetoric. You can consider the attack on unaccountable, robber-baron elites that we see in those decades to be a good thing but don’t delude yourself about the political energy behind it. They were drawing on the Andrew-Jackson energies to no small degree. It’s the same political sensibility seen, as I noted in active history, in Canada in 1911: a liberal political establishment with good credentials on the leading “racial” issue of the day, but long in the tooth, totally beaten by millionaires attacking politicians as a species and using quasi-dog whistle politics that were about to get much more overt. Or read Conrad Black in the National Post on the eve of the election. He’s not my idea of a great historian but I think he got something right about the core energies, the narratives of how and why things happen, that have driven American politics since the beginning: there’s a huge continuity in there in regards to how huge numbers of Americans think about what made them “great.” And Canada has always drunk from that stream, sometimes just a little sip, sometimes a big draught. Good point. Tom Peace had a good point on twitter, too. Toronto certainly drank from the Ford cup for quite a while. What’s perhaps most striking about the American presidential election is not what was present but what was absent. What was absent this time were effective constraints on claims, accusations, and rhetoric. I kept waiting for the “Have you no decency sir” moment, but it never came. As Trump got away with each fresh batch of lies and slander, the new normal become more, well, normal. It’s hard to know who to blame for this, because whenever media outlets challenged Trump’s lies and slander, they ended up giving him endless free press coverage. By the end of the election, the alt-right had become practically mainstream. Yet I still believed the polls and I did not expect Trump to win. Perhaps I’m naive, but I think that Canada’s national political culture still has significant constraints. There are still boundaries, norms, and standards that politicians cannot successfully cross. That may change. It’s not what politicians try to do that matters, in the end, but what they get away with. The Trump win is the perfect example of mob rule…exacty what the Loyalists were fighting against…and rightly so. Thanks for this post, Jerry. I don’t disagree with you in the main, and your example is a particularly poignant and very painful one for U.S. scholars to reckon with now! But I must disagree with your characterization of Trump’s margin of victory as either big or broad. He lost the popular vote, just as George W. Bush did in 2000, while winning the Electoral College vote. I won’t bore you with a long discourse on the EC here, but it was installed precisely because the founders didn’t want the popular vote to prevail! It’s an anti-democratic (and in its origins and its effects patently racist) break that gives more weight proportionally to votes cast in states that have a very small population. So Wyoming, Montana, the Dakotas, Idaho, Nebraska, etc. dominate the map, but they have very few voters; by contrast, the blue states on the coasts are where the people actually live. The fact of the EC and its role in overturning the will of the people proves your point about U.S. vs. Canadian national histories. Our legacy of African chattel slavery is largely to blame for the apportionment of congressional representation and thus EC votes. But please remember that the majority of Americans and the majority of voters here stood against Trump. Those red swathes on the map look big and broad, but they represent only land, not great numbers of votes. Yes, I guess I should have said “bigger and broader than most people expected,” rather than “big and broad.” But, as I watched CNN track the results by districts and counties, I was struck by how many votes Trump received in areas of the country that have nearly always been solidly democratic. That may have been the product of people voting for the party rather than the candidate, but the results in Wisconsin and Michigan indicate that something else was going on. Misogyny. Columnists, historians, pundits of all stripes are never going to understand this election if they are blind to the deep hatred – and fear – of women that exists in this country. I live here. I see it everyday … the newspapers and news reports are full of it. But the media and analysts act like they have a combination of blinders and rose colored glasses. As I said to a colleague in an email, it will be harder to understand the recent past (i.e., the different factors that contributed to Trump’s victory) than to understand the future, because I have little doubt that he will try to govern as he campaigned. Analyses and debate over the voter data from last week’s election will continue well into 2017, but the impact of Trump’s election is already being felt domestically and internationally. I agree with the previous commentator’s characterization of what we’re witnessing: hate. The vitriol spewing out of the Trump camp is difficult to describe as anything other than the language of hate. Trump’s presidency will change how Canadians and Americans see their countries, which will, in turn, shape how they interpret the past and the future.